Canada’s automotive industry is one of the world’s strongest automotive supply chains. Because of this, Ontario’s vast network of parts manufacturers are exploring opportunities to become more productive, scale operations, and improve worker skills to support technology innovation. Two manufacturing businesses in Windsor, Ontario, Service Mold + Aerospace Inc. and APAG Elektronik Corp., have recently received government funding to develop and adopt automotive innovations. The two companies are the recipients of a combined $5,600,000 in funding from the FedDev Ontario Business Scale-up and Productivity (BSP) program. FedDev Ontario’s Business Scale-up and Productivity (BSP) Stream is an Ontario government funding program that accelerates growth and helps companies adopt/adapt advanced technologies that support efficiency. Via the program, businesses can receive investments to expand their southern Ontario operations and increase exports to international markets. Service Mold + Aerospace Inc. and APAG Elektronik Corp. will utilize the funding to scale their businesses and create jobs in Windsor region. Two companies in Windsor, Ontario have received a total of $5.6M from FedDev Ontario’s Business Scale-up and Productivity program to develop automotive innovations and expand their operations. Service Mold + Aerospace Inc. is a leading supplier to the automotive, aerospace, medical, and commercial sectors. They design and manufacture compression molds, injection molds, blow molds, low-pressure injection molds, and low-pressure forming molds. Service Mold + Aerospace Inc. is receiving a $1,600,000 repayable contribution from the FedDev Ontario BSP program to help fund a facility expansion. With funding, they will install state-of-the-art manufacturing equipment in their recently built 34,000-square-foot manufacturing facility in Windsor. The new equipment will allow the company to produce parts as large as 54 feet by 12 feet, giving the facility among the largest machining capabilities in southern Ontario. In addition, 21 jobs will be created. APAG Elektronik Corp. designs, develops, produces, and supplies lighting components to automotive and high-need customers in the industrial sector. Their three areas of manufacturing expertise are concept lighting, electronic manufacturing services (EMS), and electronic control units (ECU). APAG Elektronik Corp. is receiving 4,000,000 in Ontario government funding to help launch a new North American headquarters. Their plans are to establish a new facility in Windsor, which will then serve as the headquarters for their North American operations. FedDev Ontario funding will also permit APAG to install new advanced equipment, complete manufacturing plant renovations, and hire 138 skilled employees. FedDev Ontario’s Business Scale-up and Productivity (BSP) program supports businesses as they adopt technologies which have a significant impact on productivity. The equipment funding incentive places a direct focus on using technology to grow southern Ontario businesses so that they can compete more effectively with international firms. Projects eligible to receive Ontario government funding from the FedDev Ontario BSP program include expanding management capacity, researching and developing export markets, and early adoption/adaptation of innovative technologies and processes. Southern Ontario businesses may receive a repayable contribution (no-interest loan) of up to 35% of eligible project expenses to a maximum $10 million. Applications for the FedDev Ontario Business Scale-up and Productivity (BSP) program are currently being accepted as the timeline runs on a continuous intake. 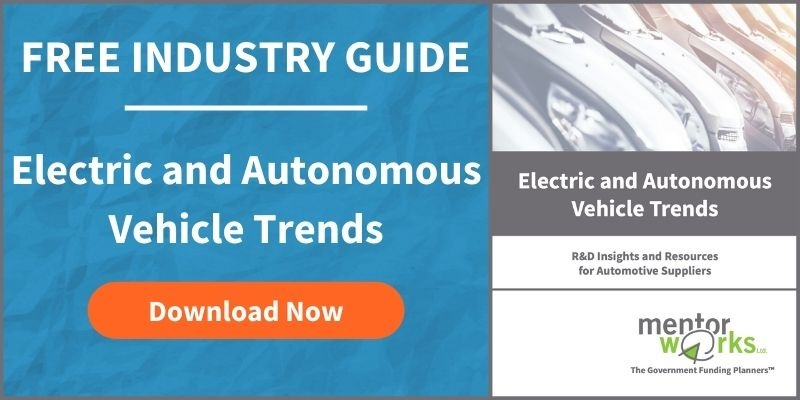 Discover how to strategically take advantage of automotive grants for technology by downloading Mentor Works’ Top Trends in the Canadian Automotive Sector white paper.